Hasn't really been a recent thread on pH meters so I'll just start a new one. My last pH meter broke over a year ago and I brewed without it for a while. Just recently purchased another Milwaukee ph55. When I went to calibrate the new meter I figured I'd just use the solutions I had on hand which were bottled solutions from probaby two years ago. The meter liked the 7.0 solution but when I moved it to the 4.0 in the second step of calibration it kept failing. So I opened the little packets of solutions they sent me and calibrated the meter. Then read the old bottled solutions to see what I got. The 7/0 read 7.1 but the 4.0 solution read 5.1 confirming my past suspicions that there's a limited shelf life on the solutions. Anyone have experience with solutions that last longer or should I just buy a few of the little packets to keep around. The bottles are pretty expensive if they're not going to last. I have 2 bottles, one of each... I haven't compared them to a fresh set... So, mine could be off... I do keep them in the fridge... I will pour them into little snit glasses for calibrating... Then dump them back into their containers..
Had trouble calibrating my brand new meter yesterday, Milwaukee ph55, mentioned above in the OP. I had just two weeks ago purchased new calibrating solutions from amazon. Meter calibrated to the 7.01 but when I used the 4.0 is kept saying WRNG. I knew it calibrated with the small packaged solutions and had used similar ones successfully prior to getting the Biopharm solutions. The Biopharm worked last week but not yesterday. 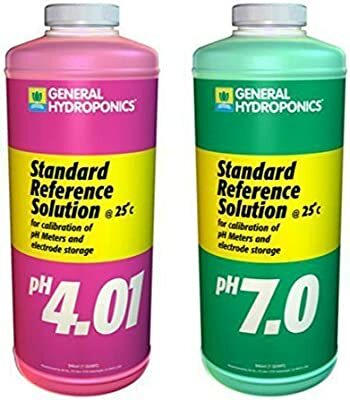 So I ordered another set of calibrating solutions from General Hydroponics which I'd used before. Got them this morning and meter calibrated the very first time. No problem. Put it in the Biopharm solutions and the 7.01 read 7.1, the 4.0 read 3.6. So in less than two weeks the Biopharm solution had degraded....not good...sending it back to amazon and just wanted to warn you guys don't buy them. The general hyroponics solutions always worked well for me. Only reason I tried another was the old bottle of 4.0 I had was no good but it was 2-3 years old. So did I until it did. Well there's you definitive truth. I guess I just dreamed it all. Well I mean yea...with all your exhaustive research on the matter this definitely concludes the thread. buffers never ever go bad. Would you care to include a statement that they're always correct as well? never a bad batch? "Hanna Tip: Our calibration solutions are designed to have a long shelf life when left unopened. Once opened, a buffer with a pH lower than 7 will last around 3-6 months, while a buffer with a pH over 7 will be good for about 1-3 months." While I may agree with you that the manufacturer and seller of the solutions might have an agenda of his own in making this statement your contention that they can't "go awry" is nonsense and proven by my experience alone. Unless you're suggesting that my brand new meter is bad or that I don't know how to use it? What I was hoping for was more anecdotal evidence of how long they may be trusted. How old was your old bottle that tested true? Well I've never kept mine in the fridge so maybe I'll give that a shot. I've also never reused them. Once I pour them and use them I just tossed them out. Brunwater has never been off by that much for me or anyone else I know that uses it. This meter has been sketchy since day one. That's why i started this thread remember? I corrected the kettle based on the meter. So we'll see. The results may show if my mash wash pH way low.